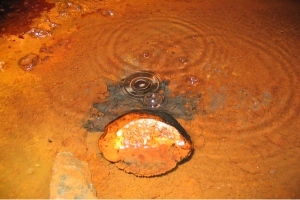 Water filtering out of the floor of a deep Ontario mine has been trapped underground for more than a billion years. It bubbles with gasses carrying nutrients that could sustain microbial life. Scientists working 2.4 kilometres below Earth’s surface in a Canadian mine have tapped a source of water that has remained isolated for at least a billion years. The researchers say they do not yet know whether anything has been living in it all this time, but the water contains high levels of methane and hydrogen — the right stuff to support life. Micrometre-scale pockets in minerals billions of years old can hold water that was trapped during the minerals’ formation. But no source of free-flowing water passing through interconnected cracks or pores in Earth’s crust has previously been shown to have stayed isolated for more than tens of millions of years. “We were expecting these fluids to be possibly tens, perhaps even hundreds of millions of years of age,” says Chris Ballentine, a geochemist at the University of Manchester, UK. He and his team carefully captured water flowing through fractures in the 2.7-billion-year-old sulphide deposits in a copper and zinc mine near Timmins, Ontario, ensuring that the water did not come into contact with mine air. To date the water, the team used three lines of evidence, all based on the relative abundances of various isotopes of noble gases present in the water. The authors determined that the fluid could not have contacted Earth’s atmosphere — and so been at the planet’s surface — for at least 1 billion years, and possibly for as long as 2.64 billion years, not long after the rocks it flows through formed. The findings are “doubly interesting”, Ballentine says, because the fluid carries the ingredients necessary to support life. The isolated water supply, he says, provides “secluded biomes, ecosystems, in which life, you can speculate, might have even originated”. His colleagues are now working to establish whether the water does harbour life.